Under the surge of the online freelancing movement, companies are solving many issues with talented professionals that provide an excellent service for more accessible prices. This scenario sounds really promising, but contrary to what you may believe, freelancers are not the end all be all solution of the new century. These current times are characterized by the omnipresence and the influence of the internet and the social networks, something that created a brand new world that allows professionals from different latitudes, backgrounds and skill sets to collaborate and work together under the form of “freelancing”. The freelancing phenomenon is far from a new thing, but it has become a new go to tool for companies from many countries that need to find some cost and time efficient solutions to certain tasks. In the United States alone, there are more than 25 million persons under this working scheme, a total that account for 34% the workforce. With the increased presence of freelancers throughout the workforce, there may be an erroneous train of thought that sees this type of workers as the answer for every vacancy or need that a company may have and this couldn’t be further from the truth. There are several elements that a hiring company may not control when working with freelancers, something that is depending the field and type of work that they run could generate some trouble. The three main issues that could create problems or void the chances of using a freelancer are: Availability, Control and Confidentiality. Availability: A huge chunk of the successful active freelancers in the market have more than one task at hand and while managing their time very efficiently they tend to have very small open timeframes and this is something that will influence greatly and diminish the time that he or she could invest in your project. With that being said, if your task is very time consuming or requires exclusive dedication, a freelancer will not be the right fit for you. Control: This one of the main handicaps of working with a freelancer. He might be extremely skilled and prepare for the work, but the amount of supervision over the job is not going to be the same as of the case of an in-house worker. If the task that you need to get it done is not possible to have precisely defined on paper or it requires way too much input from somebody that handles the corporate identity, picking a freelancer is not going to do any good. Confidentiality: This is one of the least frequent but still one of the biggest deal breakers. Some lines of work demand certain level of secrecy due to the sensitivity of the information involve or rare cases like the scheduling of a product launch or particular strategy. While is true that the vast majority of freelancer are serious professionals that know how these nuances work, they still are going to get access to sensitive information and this open the possibility of costly mistakes occurring. It’s also true that an in-house staffer could commit the same mistake, but at the end, technology allows us to get the job done while not being there, but this is something that you don’t want to deal when troubles arise. In conclusion, if your data or task is highly sensitive or require a lot of confidence, don’t consider a freelancer as your best or only choice. After analyzing all the aspects that could make you choose an in house worker, is time to see all the advantages of employing a freelancer and how at the end in most scenarios, could be the better option of the two. There may be many arguments for backing a pro freelance stance, but in this article, we’ll take three main focal ones: Skills, Cost and Flexibility. Skills: In most cases, freelancers are highly skilled professionals in their field of expertise. They are at the top of their game and continue to work to improve the abilities so they can offer the best at the work environment. This level of execution puts them a step ahead of the competition due to the qualification for any task. They may not do all the tasks that you may want, but whenever you hire them, they’ll almost likely guarantee a great job. Costs: When you employ an in house worker, you are creating a sort of relationship that is expected to provide a series of benefits and rewards so your company looks the most appealing to them. When you are dealing with freelancers, the working relationship lasts for as long as the project goes and doesn’t require any special payment. There will a fee for the service provided and that’s it. When done properly, the company gets top performance in a task for a fix price. Flexibility: It doesn’t matter if your company is a Forbes Top 100 or a start up, there’s time during the year that the business may go slower than usual. When working with a freelancer, if he’s not needed, he may go work somewhere else and come back after some time. This flexibility makes them an important asset for their role in helping to keep costs low and operations efficient. 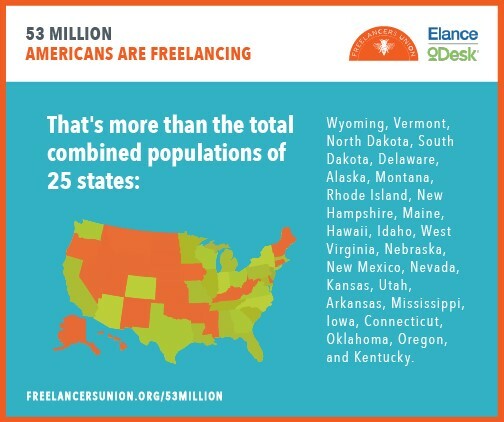 It doesn’t matter from which perspective you choose to see it, but there’re clear signs that the economy is moving more and more towards an economy based in freelancing. This work scheme not only benefits the worker, but also helps the businessman achieve its goals with a cost effective solution. With this in mind, it’s also important to reassure that as well as the freelance model is, it is not perfect and it doesn’t work always but when it does and the conditions are just right, great things can come out of it.